Sometimes you don’t have the time, effort or ingredients to cook something complicated. Getting back from work late to bare cupboards, with no inclination to make the damp and windy walk to a shop. On those days there are a few basic recipes I try and fallback on – rather than immediately order take-away. It’s a Kitchenist recipe (one of my favourite food blogs) and a recent addition to that list. Almost everything can come from the cupboard or freezer and will happily sit there for months, like the pasta, sardines and capers. A well stocked cupboard of basic ingredients can get you a long way. There are some cunning ways to cheat too. You can’t beat grabbing a fresh handful of parsley from a pot, but you can chop+freeze store bought herbs for later, it’s better than nothing (or worse, dried parsley). You can also buy a pot of lemon breadcrumbs (kill two ingredients with one stone). Yes that’s incredibly lazy, but that’s kind of the point here, minimal effort on the days you still want something nice to eat. Even cutting some of those corners the resulting dish is still lovely, a bright and flavourful dish that makes me smile on a rubbish evening. Check out the original kitchenist recipe and give it a go. 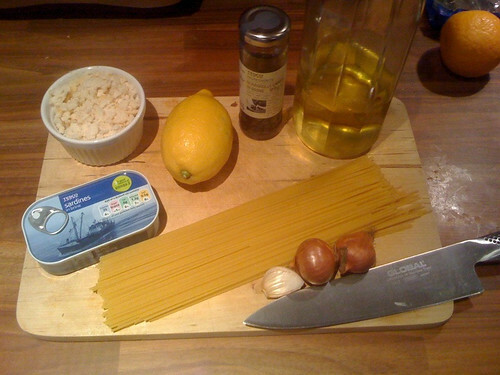 This entry was written by David, posted on April 5, 2011 at 11:28 pm, filed under Recipes and tagged fish, pasta, quick. Bookmark the permalink. Follow any comments here with the RSS feed for this post. Post a comment or leave a trackback: Trackback URL.